I first saw this recipe when it was posted on Instagram by mama.of4. Mama.of4 shared a recipe for strawberry fruit leathers which I have had to adapt to be friendly for little one. Strawberries bring little one’s cheeks up in a rash unfortunately. We can also add melon to the list of fruit to avoid as well. We tried melon this week as it was part of the Abel and Cole fruit and veg box which we shared with the in laws. Although little one rather enjoyed sharing the melon with her daddy and myself, it quickly made her lips swell slightly and caused around her mouth to go red. Anyway, back to the fruit leathers. 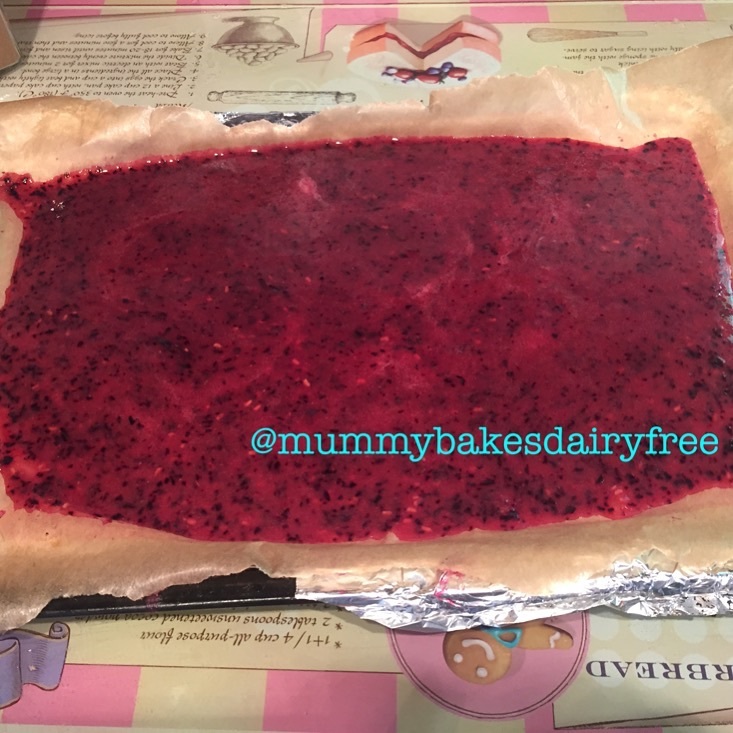 I chose to use raspberries and blueberries to make the fruit leathers and the combination worked fantastically. 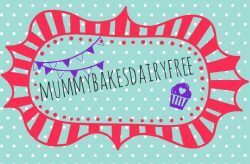 The original recipe gave you the option to heat the fruit mixture on the hob before cooking in the oven, however I chose the option to cook on a lower temperature in the oven in order to maintain more of the nutrients. 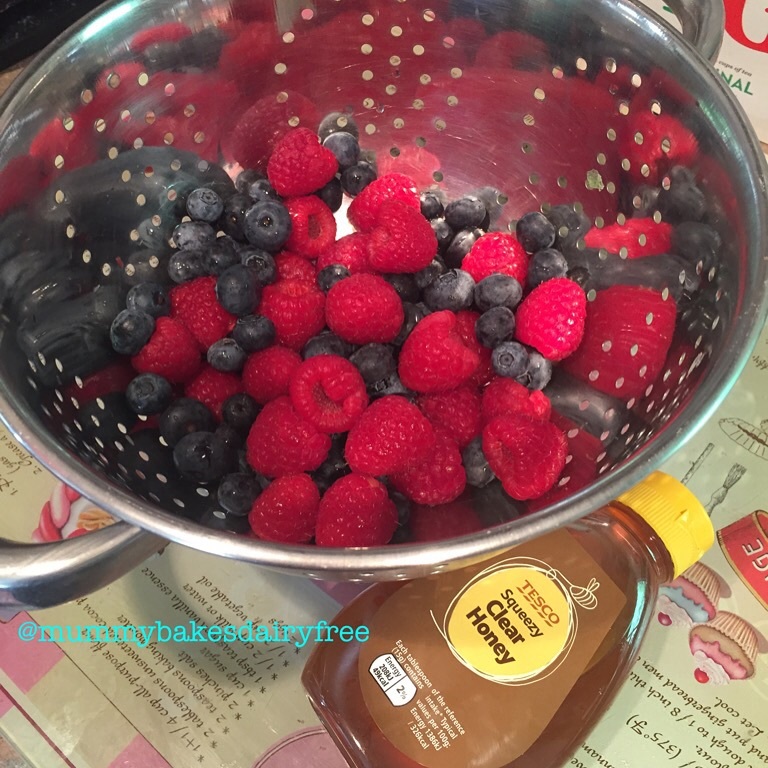 If you choose to heat the fruit on the hob cook on a low heat until the fruit is soft and then add the honey before blending. I haven’t tried it this way so please let me know if you do what the outcome is. All you need is love (and raspberries, blueberries and honey). Blitzed and ready to go for the next step. 1. Pre heat the oven to Gas Mark 1/4, 120 C (or as low as your oven goes). 2. 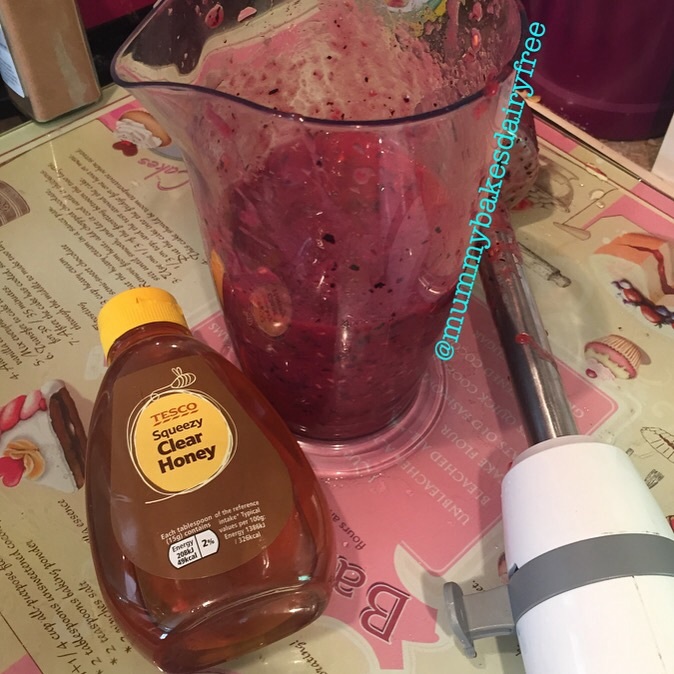 Mix together the fruit and honey in a blender until you get a smooth purée. 3. Pour the purée onto a baking tray lined with greaseproof paper. 4. Bake in the oven for about 4 hours or until the fruit leather starts to peel away from the edge. 5. 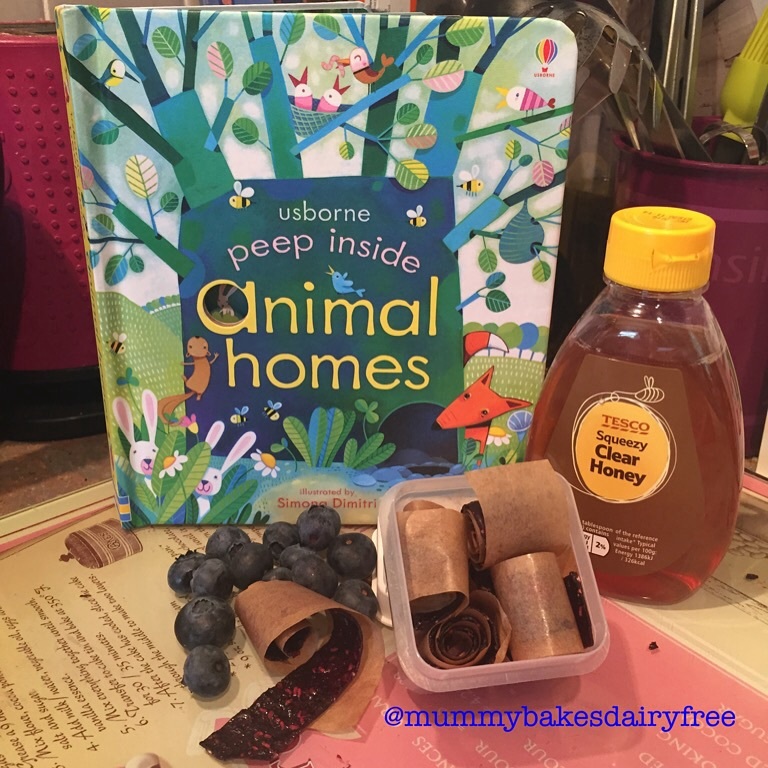 Cut the fruit leather into strips and roll up in greaseproof paper. Store in an air tight container to keep fresh. 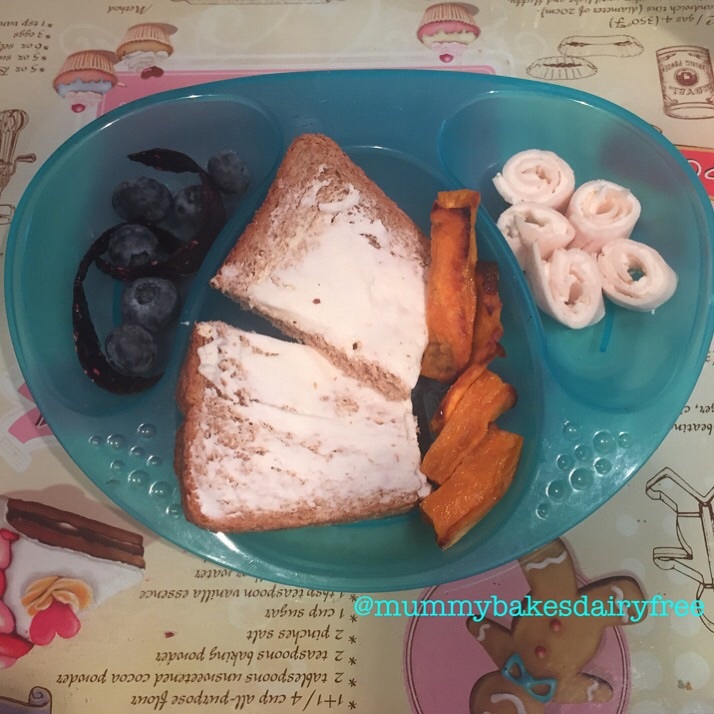 Fruit leathers and blueberries, sweet potato, chicken and violife creamy swirls and violife sandwiches.